What is it like to be a spray foam guy? There is a good story on Bizcovering magazine with an inside look at life as a spray foam insulation guy in Toronto and the piece used some pictures seen below. This is Tim, a spray tech, who is also the truck driver and generator operator. He’s on site to meet me first thing in the morning, opening up the back of the company truck and getting ready to help his teammate, the prime applicator. The prime is the rock star spray foam applicator who has had lots of training in the fine art of insulating residential houses with polyurethane rigid foam insulation. The pictures below shows Rob Campbell’s ride along on Oct 22nd to document a Toronto spray foam insulation company at work insulating a new home construction in a posh Forest Hill neighbourhood. Spray foam insulation is an excellent albeit more expensive choice for home insulation. The cost is minimum $3 per square foot of wall and roof, and the price varies depending on whether its open cell or closed cell foam being installed. Spray foam comes in two varieties, open-cell and closed-cell composition, and both types have different properties which make them good for one thing or another.. i might explain. Of the two options, closed-cell foam is the better insulator. Once cured, it also becomes a vapor retarder (because the tiny cells are closed moisture cannot enter the foam). but its disadvantage is price and weight. Its heavy and expensive and sometimes you dont need that much insulation , and sometimes its too much and open cell is better. Open cell foam has open bubbles Open-cell foam has a lower R-value, and acts as more of an air temperature and acoustic barrier; open cell foam is not an effective vapor barrier. Open cell foam is lighter, less dense and cheaper (because less material is used as it expands larger) and is applied as interior wall home insulation in places where moisture isn’t a variable. Below Montana Mike puts on a full has-mat suit with respiratory system, boots and gloves, helmet and visor. Its intense. Like any good chemical reaction there are some rather noxious chemicals produced as a bi-product of spray foam reaction between Isocyanates and the Walltite resin, both components are prepared by BASF and detailed on Fuel Ghoul blog about spray foam insulation in Toronto which outlines the process by which a Graco H40 component proportioner heats and pumps both liquids to the sprayer unit whereupon they combine at the nozzle tip of the gun. The two substances must be hot when they combine to create the best chemical effect, and to make the best R-value rigid foam insulation. In the photo below, the tech tweaks a Graco H-40 Hydraulic Series Plural Component Reactor‘s front panel , adjusting temperature on the 12.0 kW heater in the machine. 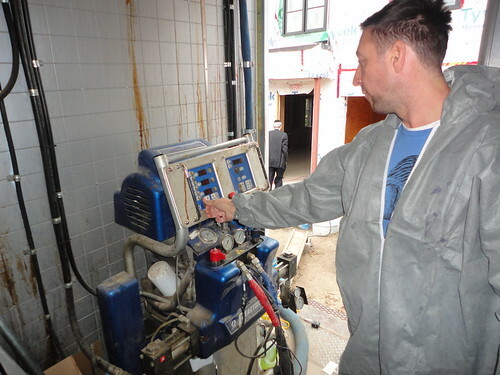 From residential foam insulation projects to high-volume commercial projects, Graco brand proportioners are a mainstay in the mobile spray foam industry. This rig alone, not including the truck and generator could cost about thirty five thousand dollars and comes with fifty foot of hose, and ten feet of heated whip and a Fusion AP spray gun applicator. Spray foam insulation is a bit of phenomenon especially here in Canada partly due to celebrity endorsements the home renovation TV shows that have propelled spokespeople to fame and fortune. These TV personalities have made deals with spray foam insulation manufacturers to endorse the product as being green and environmentally responsible, energy efficient, and 100 % cost effective – all of which is true. All the same, spray foam insulation has been in the news lately and the people and processes have been called into question by a CBC Marketplace TV news doc that shows ‘how spray foam can go very wrong’ by examining the unlivable homes of unhappy customers. What we know today as rigid foam insulation was invented in the 1950s by the German scientist Otto Bayer. He was trying to come up with something to replace rubber tires. He was eventually quite successful, but polyurethane wasn’t used to make wheels until the 1970s . Today the wheels under the folding metal steps of modern escalators are made of polyurethane, as are skateboard wheels. Polyurethane has been around for about sixty years now – it has history stretching back to Germans scientists who pioneered many synthetics before World War II. They were searching for synthetic textiles, rubber and silk. Twelve years after the war ended, in 1957 Otto Bayer and a German research team made advances with alkyd resins when they modified them with diisocyanates for the first time and made coatings and the first ever rigid foam products. Today, anyone that has ever taken high school shop class, or refinished furniture, or stained a deck knows something about urethane wood finishes and the hard substance created when it hardens on the brush. Here is the crew starting work insulating the basement of a new home in Forest Hill. They start at the bottom of the building doing the exterior wall ‘headers’. The team takes over the job site for a few hours each day and they often work lunches and late into the evening to be there when the other contractors are absent. These guys are very careful not to expose any other tradespeople to the noxious gasses often created during the spray foam application process (I had to wear a breathing mask, visor and cover-alls as I followed the applicator around the basement). 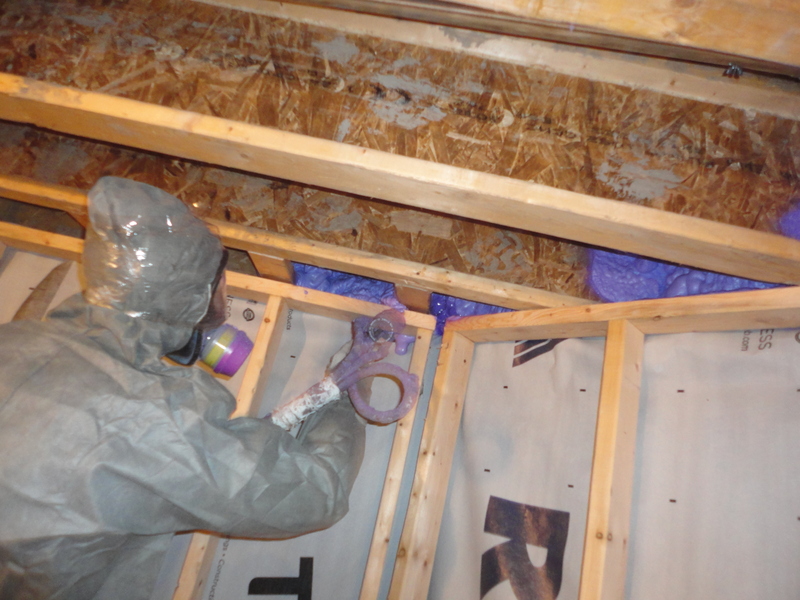 Fuel Ghoul reports that the Canadian Urethane Foam Contractors Association (CUFCA) estimates that spray foam insulation was installed in approx 350,000 homes in Canada last year, a number that has been growing by 33 percent every year over the last decade. 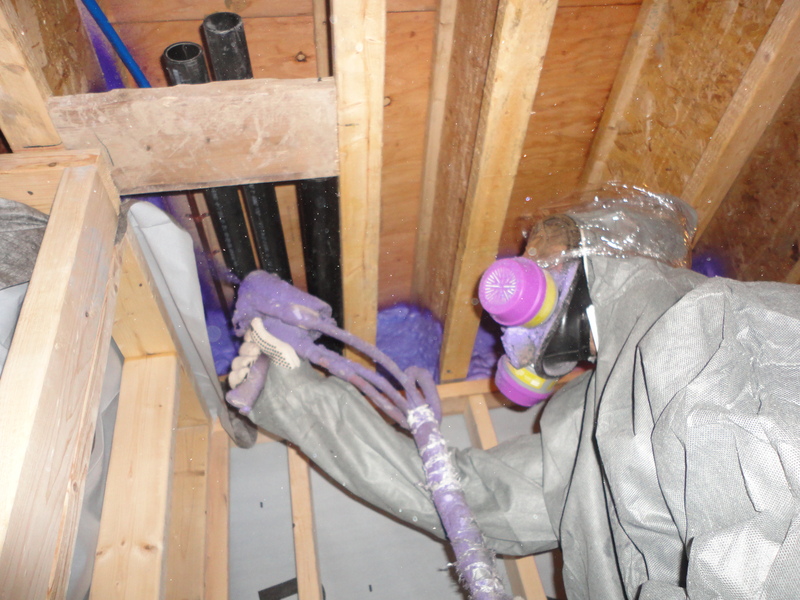 Part of the product’s appeal is that, when properly installed, spray foam insulation can reduce heating and cooling costs by up to fifty (50) per cent, according to the Canadian Urethane Foam Contractors Association (CUFCA) and so this really is advanced chemistry at work. This entry was posted in Business, Canada, construction, environmental issues, housing, insulated concrete forms, Ontario, Toronto and tagged CBC Marketplace, CUFCA, insulation, isocyanate, resin, rigid foam insulation, spray foam, sprayfoam, Toronto, Walltite Eco. Bookmark the permalink.